Nominated for both Soloist of the Year and Album of the Year in the 2018 Folking awards (results not yet announced), Daria Kulesh looks like something rather special. “Bold, exotic, impressive” Daria Kulesh is a rising star and a unique character on the UK folk scene. 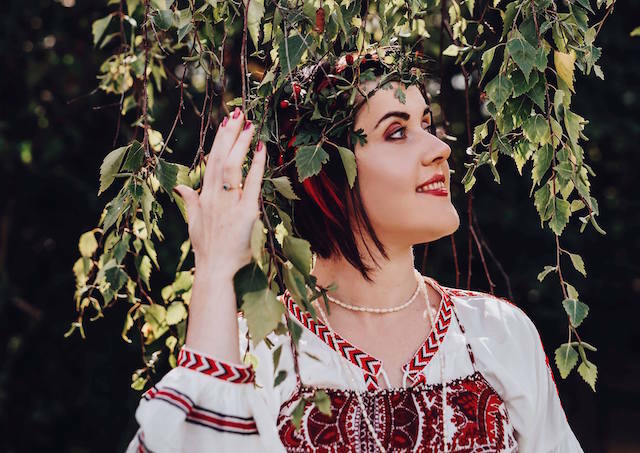 She brings a truly extraordinary voice and strong Russian and Ingush heritage and will be telling rich stories in song combined with Jonny Dyer (widely known on the folk scene as part of the duo Vicki Swan & Jonny Dyer)’s spectacular instrumental skills and composing/arranging talent. The pair have teamed up to work on Daria’s highly acclaimed new album Long Lost Home and are touring in 2017/2018 and beyond. A match made in musical heaven. This evening will be opened by emerging Exeter-based singer/songwriter & guitarist Ben Morgan. Ben writes intimate & reflective songs featuring open-tuned guitar, ethereal vocals & obliquely personal lyrics that tip the hat to Nick Drake, Bert Jansch, Michael Chapman et al whilst still maintaining a unique musical style & identity.